Not to make life a competition, but why isn't Sarah Schulman more famous than Larry Kramer? She's written one play, two nonfiction books, and nine novels, including the award winning After Delores as well as Shimmer, Empathy, and Rat Bohemia, which is one of the 100 best lesbian and gay novels of all time. Her novel People in Trouble was the uncredited basis for the musical Rent. 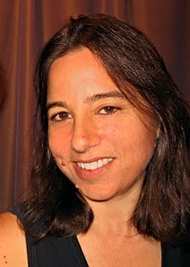 In the legal wrangling, Jonathan Larson's estate agreed that the playwright had lifted Schulman's "setting, themes, characters, plot, and ideas," yet since he did not use her exact words and phrasings, it isn't plagiarism. Schulman was a member of ACT-UP from 1987 to 1992, and with Jim Hubbard she's making The ACT UP Oral History Project. They are also filming United in Anger, a documentary about ACT UP. In 1992 she founded The Lesbian Avengers with five other women. They started Dyke March, now a global standard the night before gay pride. Her next novel will be The Mere Future, to be published in 2009.